This bracket is the perfect way to wall mount your TV. It's heavy duty, adjustable, padlockable & easy to install. 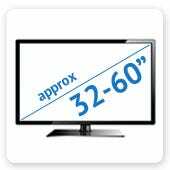 - For TVs approx 32-60"
- No more than 770mm apart horizontally (side to side). - No more than 475mm apart vertically (top to bottom). 3. 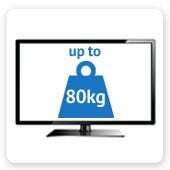 Your TV weighs no more than 80kg. This bracket allows you to angle your TV forwards to prevent glare/reflections or to better suit your viewing position. It also tilts upwards, which can make it much easier to insert all your cables once the TV is on the wall. Includes a bonus spirit level to help you with accurate installation. We include a variety of fixings (screws, bolts, spacers) suitable for most installations. 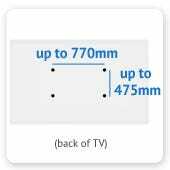 Due to the enormous range of TV brands and models available, we're unable to guarantee that the included fixings will suit every installation. Can be locked with a padlock (not included) to prevent theft of your TV. This is useful if the TV will be mounted outdoors or in a public place. Mount it to Something Strong! As with all wall brackets, it is essential that the bracket is attached to the studs (if mounting to a plasterboard wall).